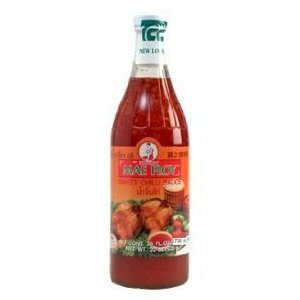 Mae Ploy Sweet Chili Sauce – 25 oz. One night after we finished a batch of super fresh spring rolls, I was eying the remaining ingredients on the plates and wondering what, if anything, to do with them. I had picked more Thai basil and ground more peanuts than we could use in the rolls. The idea of discarding good herbs that I had gone to some effort to grow and pick didn’t sound like fun. They don’t have a long shelf life once picked. My grandparents lived through the Great Depression and were hyper-conscious about not letting food go to waste. Some of that rubbed off on me. At any rate, I dipped a Thai basil leaf in the Mae Ploy Sweet Chili Sauce and tried it. The result was pretty good, so then I dipped another leaf in the sauce and then in the ground peanuts to see how that combination would fare. The combination was so good that I sat there for the next five minutes eating Thai basil leaves covered with sweet chili sauce and ground salted peanuts. The combination of flavors was addicting and compelling. It was kind of like an appetizer or maybe a kind of candy or maybe a cross between the two. Was it a desert? Was it an aperitif? Don’t have a clue. The great flavor was not at all what I was expecting from so little effort. I mean how much effort is required to combine a leaf with crushed peanuts and chili sauce from a bottle? This stuff was addicting. It wasn’t just good. It was addicting. What all this means is that one doesn’t have to go to culinary school to figure out how to put together a somewhat unique and savory combination of flavors. What one needs is a willingness to think and calculate how the flavors will come together. This does require some familiarity and experience with the flavors and spring rolls are a great to gain familiarity with herbs, nuts and sauces. Sure, the spring rolls that we made were way better than restaurant quality, but the result of the experimentation with the leftovers was totally unanticipated. This, to me, is what cooking is all about: it’s about the fun to be had in exploring and experimenting with new flavors. What is it about the trio of Thai basil, peanuts and Mae Ploy Sweet Chili Sauce that makes the sum so much better than the individual parts? This is a flavor combination that new Asian-food fans should try at least once. Shuck the peanuts and grind them in a mortar and pestle. Dip a Thai basil leaf in the sticky Mae Ploy and then in the peanuts. Or put peanuts on the leaf, roll it and then dip it in the Mae Ploy. Either way, it’s going to be good. This entry was posted in Appetizers by Harold. Bookmark the permalink.